We are delighted to announce that Sara Ahmed will be joining us at the University of Leeds* for a public lecture on Friday 11th May 2018. 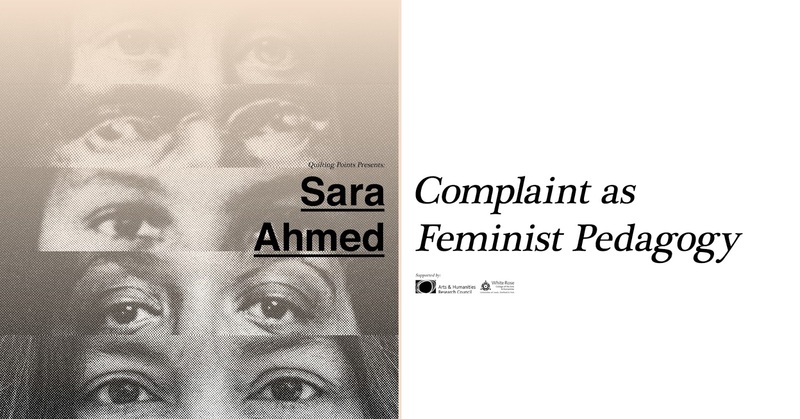 She will be presenting a talk, entitled ‘Complaint as Feminist Pedagogy,’ based on her current research into complaints of sexual harassment, sexual misconduct and bullying at universities. The talk will be followed by a short Q&A and a wine reception. The lecture will take place in Conference Auditorium 1, near the Edge. Sara Ahmed is an independent scholar and the author of eight monographs, the most recent of which being Living a Feminist Life (2017). She also maintains a lively and popular blog, feminist killjoys. Attendance is free but booking is essential as places are limited. You can reserve at ticket via Eventbrite here. If you reserve a ticket but find yourself unable to attend for any reason, please contact us at quiltingpoints@gmail.com so we may pass your ticket on to someone else. We extend thanks to our sponsors White Rose College of the Arts and Humanities and the Arts and Humanities Research Council for making this event possible. 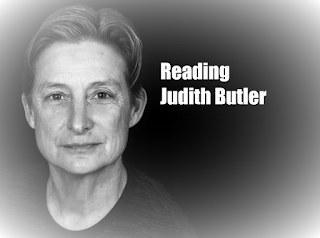 #1: 'Gender and Identity' 04/10/2018 Thursday 4 October | 5 - 6.30pm | LHRI: Room 1 | All Welcome For our first session of the academic year we will be discussing Judith Butler's ideas around gender and identity as explored in her essay "Performance Acts and Gender Constitution" and in the "Conclusion" of Gender Trouble. (Pdfs downloadable on links above). In 'Performance Acts and Gender Constitution’ Butler distills her early conception of gender performativity. She advances the idea that gender is a verb not a noun, created through repeated acts. She connects this process to the regulation of a binary gender system which is necessitated and produced by “compulsory heterosexuality.” In the ‘Conclusion’ of Gender Trouble she revisits these arguments in relation to subjectivity, identity politics and agency. #2: 'Queerness' 25/10/2018 Thursday 25 October | 5 - 6.30pm | LHRI: Room 1 | All Welcome For our second session of the year, we will be reading the eighth chapter of Butler’s Bodies That Matter (1993), entitled ‘Critically Queer’. We will be reading Butler’s discussion of queer identity, queerness and drag alongside a short section from Maggie Nelson’s The Argonauts (2015).